Question: what do Braid, Snapshot, Fez, The Witness, Hotline Miami, Super Meat Boy, our interactive fiction project, and a host of other games too numerous to mention have in common? 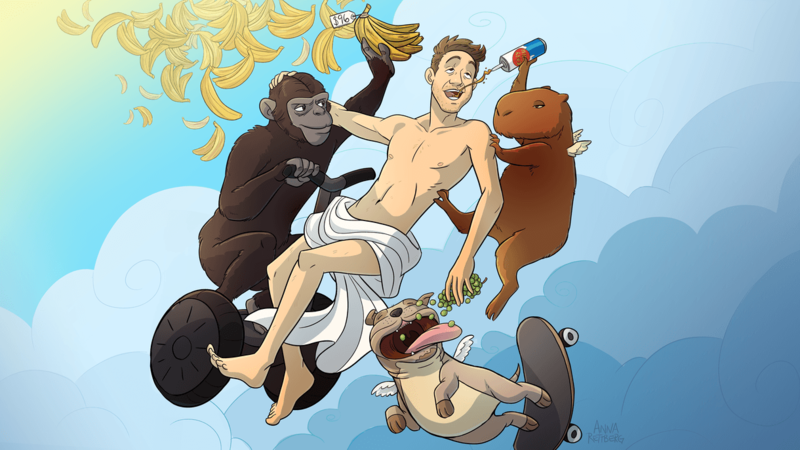 Answer: the guy in the portrait getting EZ Cheez squirted into his mouth by a capybara. He’s Jeff Roberts, the founder of RAD Game Tools. How is he related to all those games? And how is he related to Molly Rocket’s interactive fiction project? And why is he accompanied by a gorilla and a bulldog on a skateboard? Let’s start with the patronage. Jeff’s company, RAD Game Tools, makes the most popular game development SDKs on the planet. Their line of video codecs — first Smacker then Bink — is used ubiquitously across all game companies on all platforms to such an extent that any video you see in a console or PC game is probably playing back through a RAD video codec. About ten years ago, as the concept of independent game development was starting to spread more broadly, Jeff unilaterally decided to use some of the money he made from RAD to help the movement along. He began quietly providing no-strings-attached grants to indie developers so they could do basic things like make rent and buy food while they worked on their games. Jeff was so altruistic with this initiative that there were quite literally no obligations on the part of the developers to do anything other than accept the money and keep working on their games. There was no requirement for pay back, nor acknowledgement, nor anything else. He often preferred to remain anonymous, and in most of the games that shipped, Jeff’s name appears solely under the credit “Special Thanks” if it appears at all. Innovation is not a long-distance activity. Fast forward to spring 2015. Anna and I are working on our interactive fiction project, but she’s in a bedroom in upstate New York and I’m alone at Molly’s office in Seattle. If you’ve ever worked on artwork remotely, you know that it’s difficult to communicate about artistic things via e-mail. Sometimes you can sort-of compensate by using screen sharing or videos, but really there’s no substitute for being in the same room with someone if you want to collaborate properly. That difficulty becomes extreme if you’re working on a research project, as we are with our interactive fiction title. Unlike a traditional art pipeline, where you know exactly what kinds of assets you’re making, for our game we are faced with the much more daunting task of defining what the pipeline is, what assets are, how they are constructed and parameterized, and how they are processed. The difficulty of doing this by email was becoming very apparent to Anna and I, but we really weren’t sure what to do about it. We were also struggling with the problem of environment art, as we’d been unable to find an artist to work with who could do what we felt was needed for the project’s scenery. It was looking like we’d have to cut our losses and accept a pretty low level of quality for several aspects of the game, which is never a happy prospect for a pair of passionate game developers. But as luck would have it, Anna was starting to get the itch to move out of New York, and we happened to talk about it one day on the phone. The prospect of working together and getting the art right was tempting enough that I decided to send out an e-mail to some of my more finance-savvy friends to see what options we might have for getting financing — enough money to pay for Anna to relocate and ensure she could stay on permanently, as well as some extra to give us a chance to try to find a great environment artist to work with. Less than a day after sending out e-mail, I got a message from Jeff that he believed we were going to do something cool with our project and that’d he’d help fund us. I wasted no time in accepting, and Anna wasted no time in relocating — we got funding in May, and we were working together in the same office by July. It’d take a very long time to enumerate all the things that wouldn’t be in our game without Jeff’s help. There are dozens of little things that Anna and I come up with every day that we never would if we weren’t in the same office together, so our game will ship with tons of additions and improvements that simply wouldn’t have been possible without Jeff. But there are also some giant new features of the game that have come directly out of our ability to collaborate constantly rather than occasionally. One in particular is so bold and immediately obvious that it may well end up being one of the more talked-about elements of our visual design, and it was conceived completely during an idle conversation Anna and I had while taking a break. Giving ourselves more die rolls to find a background artist finally paid off as well. After going through literally hundreds of portfolios and working with several artists, we finally found John Loren, a phenomenal illustrator whose work on the game has been breathtaking. It really makes a massive difference to a small team to know they have the money they need to do things right. The difference reliable funding has made for us has been dramatic, and it took our game from looking decent to looking strikingly beautiful. We’re really proud of it, and we don’t take for granted that it never would have been possible without Jeff’s help. Jeff loves videos of animals doing human-like things. A lot of people with money just go around being dicks all the time. Often times they run for President. Other times they buy sports teams and force cities to pay for their stadiums. So what makes Jeff different such that he actually tries to help people, especially game developers? Well, cognitive-behavioral science has not progressed to the point where we can answer this question definitively, but the evidence overwhelmingly points to one thing: animal videos. Jeff loves animal videos. He watches lots of animal videos on YouTube and animated animal GIFs on imgur. He’s particularly fond of any video where an animal is doing something that seems human, like riding a skateboard or segway. He loves to send these “animal links” to his friends with titles that describe the situation or what he believes the animal to be thinking. One particular favorite of his was just two images, one of a closed front door shot from the perspective of someone inside the house, and then another of the door open with a horse standing there looking back at the camera. He titled that e-mail, “Ding-dong, it’s horse.” In his mind, the horse had rung the doorbell. It was coming over for a visit. Jeff has a lot of trouble ordering things on-line. Jeff also has a bit of a problem ordering things on-line. For whatever reason, he always assumes that the number of things shown in the product photograph is the number of things he is ordering, even if the description of the item clearly states it is a “12-pack” or “set of 3”, etc. This has lead to a number of incidents where Jeff receives dramatically more of something than he was intending to order. In one particularly memorable incident involving Amazon Fresh, he enterred the number of individual bananas he wanted, not realizing that the bananas were enumerated per bunch. The following day, he awoke to a mountain of boxes at his front door filled with nothing but bananas. With all that in mind, hopefully you can see how Anna’s portrait of Jeff is really the only logical depiction. Given the impact he has had on our project, Anna and I wanted to give Jeff a proper, prominent place on our web site, so we asked if it was OK if we did a bio page accompanied by one of Anna’s signature portraits. He said yes. I asked how crazy we should make it. He said “full crazy”. Thus Anna and I tried to synthesize all the elements of Jeff into one picture, something that showed him as the benevolent, helpful diety that he is to a lot of us indie game developers, but which also captured some of his unique quirks. We settled on an updated Bacchus. We hope he likes it — and we hope you do, too!